Modulation is a swirl of color that brings vibe and movement to recordings and performances. Positive Grid’s groundbreaking component emulation technology allows BIAS Modulation to recreate the thick and chewy sounds of a host of classic modulation devices, from vibrato and chorus to rotational speakers and ring modulators, putting a virtual encyclopedia of modulation on your pedalboard in a single parking space. Say goodbye to the days of ripping apart your existing pedalboard to try out new sounds: with support for 9 customized presets and multiple modulation engines, BIAS Modulation has all of the tools you’ll need for classic tones at gigs or sessions. With BIAS you can finally end the Pedalboard Shuffle—just download one of the thousands of pedals available on the ToneCloudor customize one yourself to explore new sounds and textures. Positive Grid’s unique component emulation engine allows you to recreate a host of classic modulation devices, expanding your effects library and redefining what the term “modulation pedal” really means. 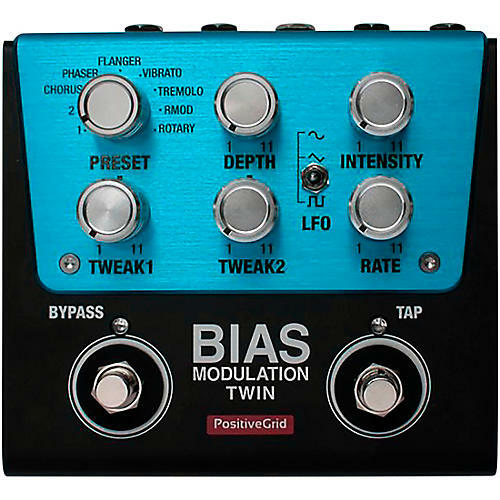 Using BIAS Pedal software on a desktop computer or mobile device, you can use two separate modulation engines and choose between modulation types, change wave shapes, and use the exclusive Wobble control to take it to the next level. Change the headroom by varying the voltage on the virtual power supply, modify the sustain with the compression section, or utilize two super-flexible EQ stages for even more tone-shaping power. There’s even a built-in noise gate—the sonic possibilities are immense! Offering both True and Buffered Bypass operation, BIAS Modulation is built into a sturdy road-ready enclosure and uses high-quality components. Built-in Bluetooth wireless makes it easy to tweak sounds with your mobile device even at the gig, and the industry-standard DC power jack is compatible with every professional pedalboard power supply on the market. You don’t have to be a tweakhead to take advantage of the creative power under the hood of BIAS Modulation. All BIAS pedals can connect to the Positive Grid ToneCloud, giving you access to thousands of custom pedals uploaded by artists, recording studios and fellow guitarists. With the ToneCloud, an entire library of classic modulation sounds is at your fingertips.